A used Nissan Juke is what's known as a 4x4 crossover. 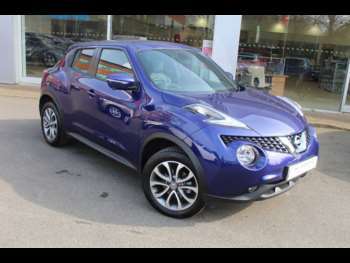 The distinctive good looks of the Juke, combined with its competitive pricing, have helped to endear it to UK buyers. And you can find a number of attractive second-hand examples for a great price. Renowned for their reliability, a used Nissan is a great buy. Their well-earned reputation is not shaken by the British-built Juke, which is robust and has so far proven to be undemanding on the wallets of its owners. A used Nissan Juke proves that you can really win over a wide audience with styling, while pleasing enthusiasts with a driving experience that doesn't have to make compromises. You can accuse the Nissan Juke's design of being many things, but boring is not one of them. It is chunky and bold like all good 4x4s, but manages to squeeze in sportier elements to keep things sleek where it counts. It may be larger than many other superminis on the outside, but it is compact and the styling inside is modern and quirky, as well as being rugged enough to withstand family usage. Engine options include a base model 1.6-litre petrol unit, a 1.5-litre diesel and turbo-powered range-toppers that give you performance equivalent to that of competing hot hatchbacks. While a used Juke may not be an off-road maestro in spite of its looks, it does have the benefit of being designed to combine comfort and fun handling into a great driving experience on urban highways and country lanes. The clever 4-wheel drive system is not present on many Juke models, but it offers intelligent application of power to each wheel for those who desire it. The 11.5-second sprint to 60mph offered by the basic 1.6-litre iteration is not the quickest, but the turbo-charged Nismo Edition provides a much more competitive 7.8-second rating. If you are looking for fuel economy on a second-hand Nissan Juke, the diesel delivers a combined 57.6mpg score, while the turbo will be able to achieve 40mpg if you drive it carefully. Got a specific Nissan Juke model in mind?